Self-pressure feature enables spiral slicing quickly and effortlessly, make professional-looking garnishes, apple chips, onion rings, potato nests, elegant salads, vegetable pizza toppings, and much more. Featuring ribbon slicing, thick or thin julienne slicing (shoestring style cutting). Three ultra-sharp German 420-grade hardened stainless steel interchangeable blades, stored in built-in blade holder. Improved handle bar design better for heavy-duty food slicing works. Non-skid base keeps unit in place and secure on counter. Easy release knob for changing veggies effortlessly. Components come apart for easy cleaning. 1.25 Quart BPA-Free container. Study, durable construction. Dishwasher safe. 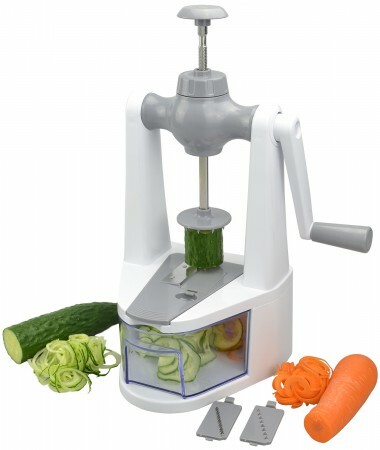 Surpahs Vertical Self-Pressure 3 In 1 Vegetable Spiralizer is an ideal kitchenware for making spiral slices from firm fruits and vegetables like apples, onions, carrots, zucchini, cucumbers, cabbages, beetroots, turnips, rutabagas, large radishes, potatoes, sweet potatoes, squash, and many more.